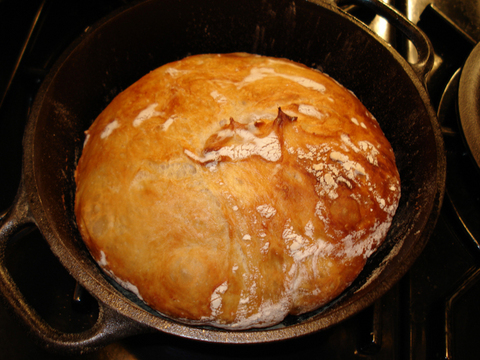 Friday night UPS delivered my new little Lodge cast iron 2 quart Dutch oven and within minutes I mixed a half recipe of the no-knead bread and set it to ferment for it’s 18 hour visit in the 70ºF/21ºC bedroom. This is the way I’ll do it from now on as with just two of us and the limited shelf life of the bread it’s the perfect amount for dinner and the next day. It was so delicious I ended up making an open-faced butter and grated chocolate dessert after dinner! The preseasoned pot is so adorable and so easy to lift in and out of the oven I’m going to use it for all sorts of other things as well. I happen to adore cast iron and have a sizable collection of odd shapes and frying pans of all sizes. I even have my grandmother’s which is about 100 years old! Technique for mixing is the same as for the big No-Knead—Whisk together the flour and yeast and when the yeast is mixed in THEN whisk in the salt. With fingers or a spatula stir in the water just until all the flour is moistened. Cover tightly and set in a 70º/21ºC. room for about 18 hours. It will have risen by more than double and be filled with little bubbles. With oiled spatula, scrape it out onto a floured silpat and with floured fingers and bench scraper quickly and loosely fold it in thirds first in one direction, then in the other. Re-flour the silpat and set the dough seam-side-down on top. It will be 5”x 2”high. Flour the top, cover it with a plastic dome or bowl , and let it rise in an 80ºF/26ºC. room for 2 to 2 1/2 hours or until it is 7" wide. and still 2” high. While the dough is rising, preheat the oven and pot (with lid) for a minimum of 1 hour at 450ºF/230º/C. Remove the pot from the oven. Sift a little flour evenly over the top of the dough and brush off any excess flour from the silpat. Now lift up the silpat and invert it over the hot pot. Unless you used a ton of flour the dough will be sticking slightly to the silpat which is perfect because all you have to do is curve the two edges of it and hold them together with one hand and gently push the dough away from it with the other. What I love about this method is that your hands get nowhere near the very hot pot but the bread does. 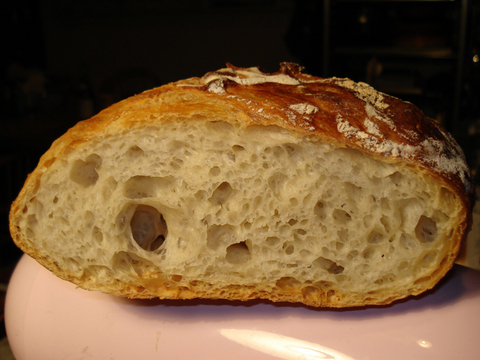 And where the bread tears slightly at the top, where it had stuck onto the silpat, it creates an interesting design. I have an oven stone in my oven so I set the pot with the bread on top (covered with the lid of course) and bake for 20 minutes. Remove the lid and bake for another 20 minutes or until the top is the color you want it to be, rotating it if it is browning unevenly. Even with the hot oven stone the bottom didn’t burn. I think it was the bran that caused it to get too brown in my last 10 larger loaves. 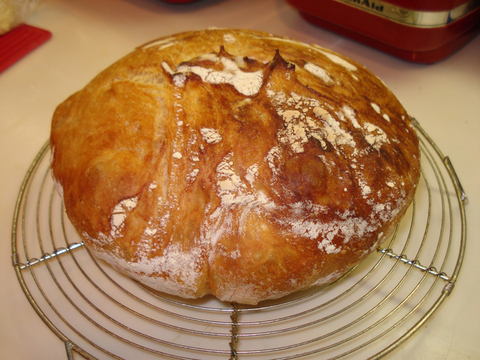 Empty the loaf onto a rack to cool completely.It will be 6 1/2 inches wide and 3 inches high.